Please note that times and dates are subject to change without notice - please call ahead! ​Finally, our friends with Autism and other disabilities can enjoy the movies too. There was a time when I would take my son Richie to the movies and we would leave, sometimes ten minutes into the movie, or sometimes during the preview trailers. Richie, is my thirteen-year-old autistic son and he loves the movies. I'm not quite sure what part he loves best, but I suspect he loves the warm, buttery popcorn, the sour patch worms, and the ice-cold, Hi-C fruit punch drink. From the moment we sit down, he's looking around the theater smiling. As the sponsored commercials were being featured, he's checking out the reel in the back of the theater. What ever it is about being at the movies, he enjoys it. However, he has autism and there are behaviors that are understandably, not appreciated at the movie theater (Richie's moaning, loud sounds, yelling, or hand-flapping). However, if you're a member of the disability community, you know that there are some things that cannot be helped. People exhibiting behaviors resulting from their disability should be able to enjoy the thrill of watching a featured film on the big screen. * We had to wait a couple of weeks after the movies release in hopes that the big crowds would begin to dwindle down a bit. * We had to plan to go to the very first movie showing in the morning (fewer people was my hope). * We had to drive in separate cars. I always anticipated leaving before the movie ended (why should everyone have to leave?). It was inevitable. Richie and I would have our drinks and snacks in place when we sat down at our chosen seats. He would be quiet for a time during the previews and then he'd get excited and start making noises. At first, no one would turn around, but my nerves would already be on edge because I knew any moment we would need to leave soon. In time, Richie's noises would get louder and more frequent. At this point, people are now turning around and glaring angrily at us. I would gather our snacks and drinks and off we go. Sometimes Richie would start crying because he didn't want to leave. It was always heart-breaking. My first experience at a Sensory Friendly Film was interesting. I remember it was the "Smurfs" movie. It wasn't the kind of movie we just had to see, but it was featured at our local AMC theater as a "Sensory Friendly Film," so we decided to go. Richie and I had our snacks and drinks in hand, as we found our seats. Richie was about eight years old. There was a family sitting right behind us, two cute little girls accompanied by two women. We both sat quietly through the previews, Richie was smiling eating his popcorn. We saw a few of his classmates walking into the theater with their parents, and Richie recognized them along with his classroom aide. He was smiling at me and looking around the theater, I guess to find out who else he might recognize. The movie started, and like clock-work, Richie started moaning and making loud noises. He wasn't upset, he was excited. I started to get that nervous feeling again. I remember thinking to myself that we should probably move our seats so the children behind us aren't too disrupted by his sounds. I started to gather our things and got up. The woman behind me noticed what I was about to do. "She's getting up and leaving," she said to her friend. "Excuse me, don't leave," she touched my arm. I turned to look at her, and before I could say a word she said: "This movie is meant for him. Please, don't you move." "Thank you," was all I could say. I could think of more to say, but I was overwhelmed and had gotten emotional. We sat back down, and I smiled as the tears streamed down my face. I was so grateful to be able to sit through an entire movie with my son and it was a memorable experience. 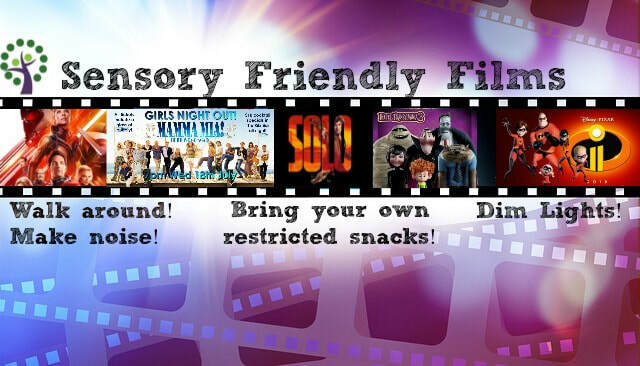 We experienced many more Sensory Friendly Films together and I had no idea that there would be a time that I would pay those kind words forward to another parent. A mother and son were sitting in the back of the theater. Her son had gotten up and was just walking up and down the isle. He wasn't disturbing anyone, he was making some noise but in this setting it was completely acceptable. There was a couple with an infant baby sitting in seats that ended by an isle the young boy was walking past. They would noticeably glare at the young boy each time he uttered a sound and walked by. His mom, probably feeling as I did many times before, was about to get up. "Miss, unless you feel your son should be seated, please leave him be. This movie was meant for him and his behavior is completely acceptable." The mom kindly replied, "Thank you." She sat back down. I'll never know but I wonder if tears streamed down her cheeks as well. I don't know if the couple with the infant baby heard us, but they never turned their heads again. These type of community events are crucial for all members of the disability community. There are other venues that respect and understand the difficulties and barriers that individuals and families of children with disabilities experience with regards to participating in community and recreational activities. Many have made provisions in their establishments that make their services and activities more accessible for these families. Bowling Alleys, Aquariums, and Amusement Parks are just a few recreational establishments that are working to ensure access to members of the disability community. In the past, some have designated certain time slots for just individuals with disabilities and their families to enjoy. These establishments are working hard to go beyond ADA requirements, they understand that there's a market-population out there that have a right to participate and money to spend!